We recognize and thank businesses that support wildlife conservation. If Image Wild played a role in introductions, we proudly highlight that. 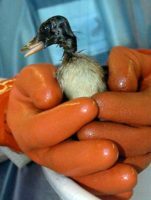 Cleaning an oiled duckling (credit IBRRC). Proctor and Gamble, the makers of Dawn dish washing liquid, have supported wildlife conservation for decades. Dawn is excellent at removing the oil that can contaminate birds during a spill, but still gentle enough to protect their feathers and eyes. When customers buy a bottle of Dawn and register online (here, for example), wildlife organizations receive support. Have you seen an ad with wildlife? Let us know if you have seen an ad using wildlife imagery.